Canada’s Athabasca Glacier Adventure is full of fun! It is worth the 2.5 hour drive from Banff to the Columbia Icefields visitor centre. If you remember from my previous post “Exploring The Canadian Rockies,” we had purchased the “EPIC” pass from Brewster which included the Glacier Adventure tour. I’ll get to that in a moment, as we actually did 2 tours at the Athabasca Glacier and yes, it was worth it! My husband wanted to do something adventurous, he’s been longing to trek on a glacier not sure why. 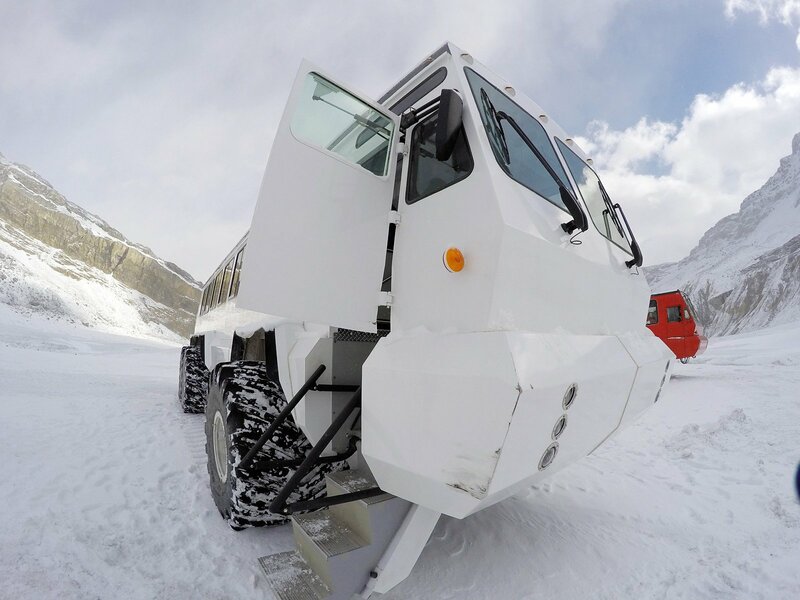 What Brewster’s “Glacier Adventure Tour” offered was a more safer experience and little physical activity as you are transported to a huge Ice explorer vehicle to a spot where you get off and enjoy about 20-25 minutes on the glacier. The whole experience lasts about an hour, and probably a great option for people who can not do too much physical activity. Now on to my review of the Glacier Ice Walk tour which is a bit more extreme (My husband told me it would be a nice short hike lol). We did the Ice Walk Deluxe tour, which is about six hours up the entire length of the lower Athabasca Glacier. This was by far the most thrilling and exciting part of our vacation! Once you reach the Glacier, every step from there on is a hazard and you must pay FULL attention at all times as you can easily fall into the crevasses and holes. Sabina was our tour guide and I have to say, she was incredible! She kept us all safe, we followed her instructions and guidelines. If you book this tour, make sure to read all the proper guidelines on their website and come layered up as it is very cold on the Glacier. The video above shows you the IceWalk Deluxe tour first, and towards the end, the Glacier Adventure tour by Brewster. Like I mentioned, as if going to the Glacier wasn’t enough, and my husband LOVES adventure, we did the Glacier Adventure Tour offered by Brewster. This was a different experience, more laid back, and meant for people who can not spend 5-6 hours hiking the glacier, or due to physical limitations, this is your best bet. Make sure to arrive early, at the Columbia Icefield Visitor’s centre gets full of tourists. Thursday, September 24th we booked the IceWalks tour, the weather was actually wonderful. On Saturday, September 26th, we did the Glacier Adventure tour and it was snowing and very windy. It’s incredible how quickly temperature and weather can change. The best part was that all the pine trees were covered in snow and made our experience special. Wow, what an amazing blog with lots of pictures! I think you have really enjoyed your tour! Thanks or sharing your experience with us. All the best for next time. Thank you so much Monika! The trip was incredible. Lot’s to see in this beautiful world!